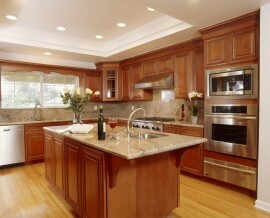 Designing your own remodeling project is often considered a do-it-yourself project for many homeowners. After all, it is your own home and you know what you want more than anyone else. But before you start thinking about rearranging your own living room floor plan or remodeling your master bathroom yourself, take into consideration the following items that may help you in deciding whether or not you need to hire a professional interior designer. Do You Have Enough Time: Most of us don’t even have enough time to cook three square meals a day, let alone deal with all the management involved with choosing materials and furnishings, finding the right vendors, price shopping, finding qualified tradesman, etc. Depending on the project size and complexity, expect to work on that project for months trying to put together all the pieces for your project until you get a floor plan finalized and ready for production. Once you do that, you will still have to perform due diligence to find qualified tradesman – a plumber, electrician, carpenter, and painter, for example. An interior designer should have those tradesman as part of their network readily available, or a qualified full-service contractor they know can carry out the plans to specifications. Can You Put Together All the Pieces: Maybe you have the time, but are you bogged down by too many choices and options, or are your choices in conflict with your spouses? Homeowners love choices, every kind and every color. But how do you know which colors coordinate best with others? What about fabrics, style, and furnishings? You may discover once you put all the colors, fabrics, and designs together, it just doesn’t reflect the design harmony you thought it would. Interior decorators or designers have the expertise of not only quickly developing many options but more importantly putting all those pieces together while avoiding decorative pitfalls along the way. Not to mention, they may also serve as an arbitrator to conflicting choices. Do You have the Skill: If you’ve narrowed down your choices and put it all together with a floor plan, you still may not recognize other intangible qualities for design. Interior designers recognize not just coordination of colors, fabrics, and furniture, but even 3-dimensional features such as spacing or furniture placement, or intangible qualities such as lighting or mood. Are You Willing To Put In the Effort: To become an expert do-it-yourself designer, you might have to do a lot before finalizing a feasible floor plan with all the colors and furnishings: read an Interior Decorator book, do online research, peruse through magazines, talk to friends about their home designs, look at showrooms and furniture stores, maybe purchase some design software, and draw up some rough schematics. Here are some helpful online resources for those doing research on Interior Design: Home Portfolio, Home & Design, or Interior Design. For your $20,000 to $30,000 dollar remodel project, expect to spend anywhere from $1,000 to $3,000 on average for a serious interior decorator. While top designers earn anywhere from $100 to $200 per hour, you can certainly find young and talented designers who charge half of that in Charlottesville. Or, as in the case with a local Charlottesville contractor, an initial development fee for remodeling drawings includes those services in that cost.